You play Zooscape over a series of five rounds. 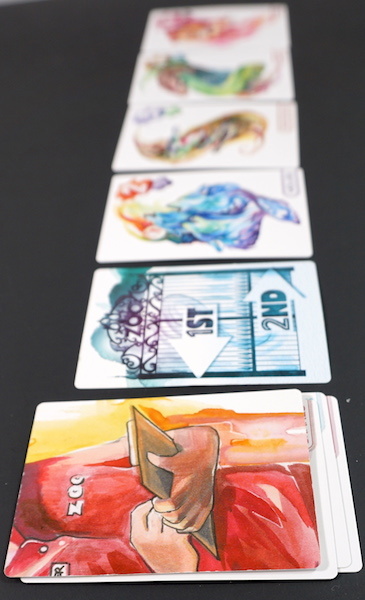 At the start of each round, you will lay out a number of cards (scaled to the player count) in a straight line. 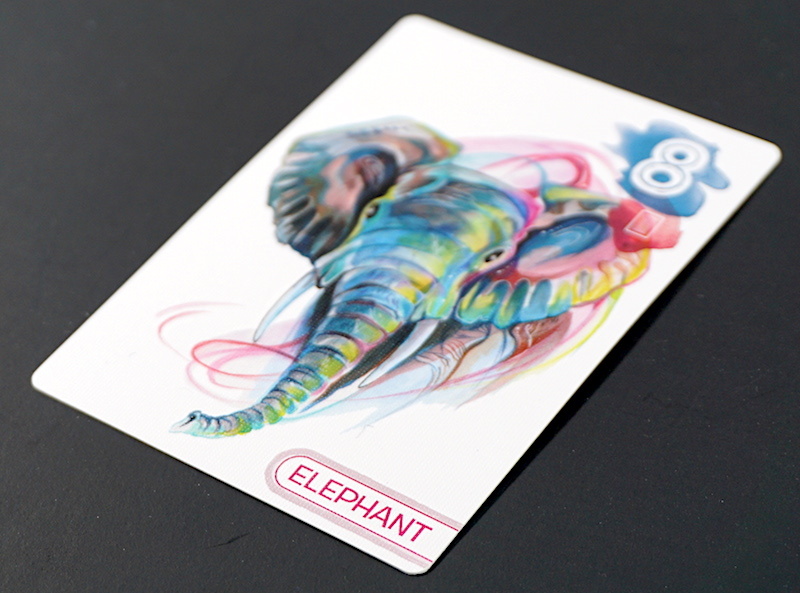 Each card has an animal, one of several types (suits), and each type has a certain point value. The first player will split this line of animals in half using a special gate card. Players will then secretly select one side of the line or the other, and all reveal their choices simultaneously. If you are the only player to lay claim to a side, congratulations! You collect all those animals. But if multiple players make the same selection, that side is further subdivided by the gate card again, but placed this time by player two. Secretly select again, collect cards if you are sole claimant. Or you continue to recursively subdivide the line until finally either all the cards or collected. 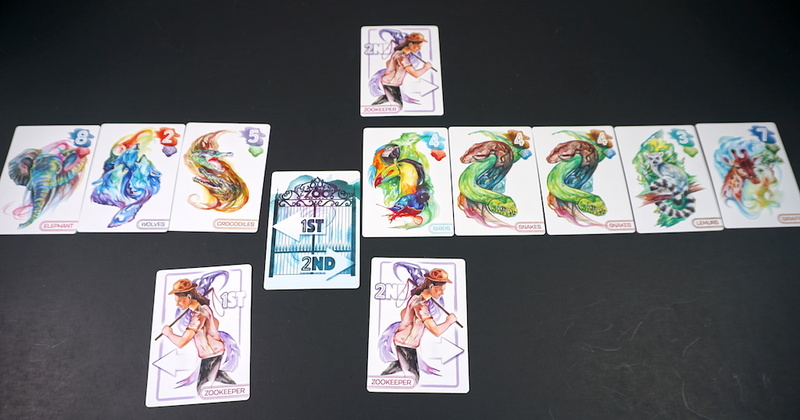 If you can’t divide any further, the remaining contesting players get a single fish card as a consolation prize. Unclaimed animals get put under the special Clipboard card, which (I failed to mention) gets placed in the line at the same time as the gate. Whoever ends up claiming a line side that has the clipboard in it gets all the uncollected animals. This is not as good as it sounds. Why? Because the final glorious wrinkle to the game is that the cages for housing your collected animals are limited in size. If you get caught at the end of the game exceeding the cage limit, all of the animals of that type are negative 1 point instead of their face value. The box lists the playtime as 15-30 minutes. Your first play will probably exceed 30, as you get used to the line splitting and animal chasing mechanics. By your fourth play, you’ll have it down and you’ll finish in 15 minutes or less. That short playtime really helps the replay value. After counting the final score, you’ll find yourself immediately interested in trying out a different strategy and encouraging your tablemate to start shuffling the cards. Maybe I should divide the line very unevenly at first, so that everyone goes for big side, and I get the remainder uncontested? Or maybe everyone calls your bluff, and the big side goes completely unclaimed and sent under the Clipboard. What if I purposely try to let my opponent collect a lot of cards, so that they accidentally go over the cage limit? Or try to collect only the high-value animals. Or try to force every single contest down to the consolation prize of fish. In our playthroughs, we’ve seen every one of these strategies employed, and more. And we’ve seen every one of them work and fail. The key to winning this game may come down to understanding the personality of your opponents more than anything else – whether they be incorrigible bluffers, reckless collectors, or fair-minded competitors. 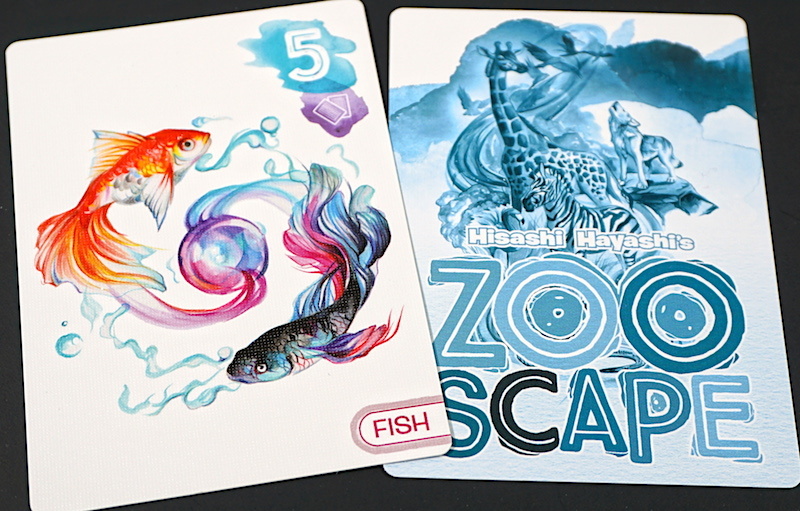 The myriad strategies make Zooscape unpredictable fun when playing with kids. It’s especially bonkers when you have a little one with a mischievous streak who prides himself on being completely unpredictable with their line division or side selection choices. The box lists the ages as 14+. But our upper elementary age children had no problem following the rules and being engaged participants. Your fortunes (and those of your kids) can change in an instant, so if you have someone who struggles with being a sore loser in your family, you may want to avoid this one. But I’d suggest you can learn to laugh with this game, and laugh often. Console yourselves with the thought that victory is just another 15 minute playthrough away. Before I wrap up I need to make mention of the absolutely gorgeous artwork by Katy Lipscomb. The animals are rendered in vibrant, swirling watercolors that strongly evoke the beautiful style often employed by Hawaiian street artists. Their beauty alone really levels up the perception of quality of the game materials, which otherwise are nothing more than a standard card deck (no tokens, no scorecards, not even a quick reference). So come for the unpredictability and strategic variety, stay to admire the artistry, and escape into fun with Zooscape. You can order your own copy of Zooscape from Amazon for less than $15. The Family Gamers received a review copy of Zooscape from Tasty Minstrel Games.